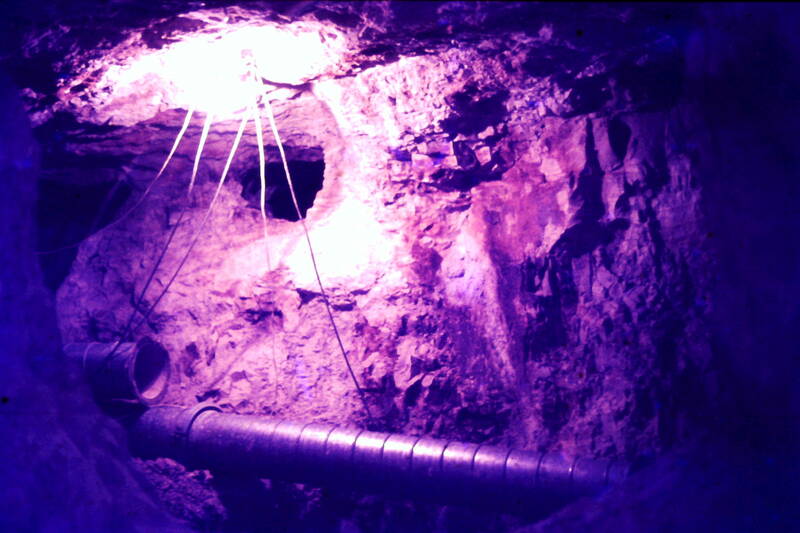 The object of surveying a claim is to provide the Mining Registrar's office with a diagram wish shows where you which to register a claim in relation to a fixed point or survey mark. A survey needs to be done as accurately as possible to avoid overlapping adjoining claims" on paper" and if your pegs should be removed from the ground or stolen they can be restored, from your survey details, as close as possible to where they were previously. 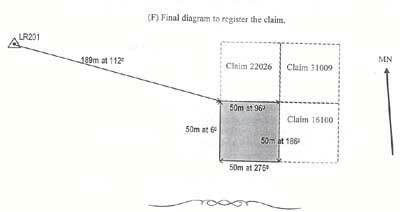 (A) Locate the area where you which to peg a claim and ensure that this area is not covered by any other claims. All registered claims should have a steel peg or wooden post at each corner with tags attached that show the claim's registration number. (B) At each corner of the area that you which to register you should hammer in a peg or place a wooden post (at least 75mm thick) that protrudes at least one metre above ground . Trenches (1metre long by 15cm deep ) or rows of stone should be placed at each corner post to indicate the direction of the nearest adjoining post . A possession notice should be placed at on a board on the northern or north eastern most corner post of your claim indicating the date of the mark out of the claim ,the area being pegged ,by who, etc. (C) Determine where the nearest survey point is located in relation to your claim. Typically this will be a six foot (2metre) high black and white steel post or three foot (1metre) high white post with a tag or plate showing the survey mark number (eg. LR 201). (D) take a measurement with a tape measure (do not step it out ) from the survey point to the nearest corner peg of the intended claim .With a compass, measure the bearings from the survey peg to the claim peg..
* When reading a compass it will usually show two set of numbers , one set is written in larger figures then the other. Use larger figures for all measurements as they show the actual bearing while the smaller figures give the back bearing. This back bearing is not interchangeable with the actual bearing because there is a 180 degree difference between the two measurements. * When taking bearings , stand at least a couple of metres away from vehicles or the post that you are siting over. Standing too close to these will vary the earth's magnetic field in that area and the compass will give an incorrect reading. * All claims are to be pegged as a 50 metre by 50 metre square, unless surrounding claims or improvements restrict the area that can be pegged to some other shape. The maximum surface area that a claim can cover is 2500 square metres. * Where it is not possible to directly see the nearest claim peg , you can put in a "dog's leg"(or bend) in the survey line . take a bearing and measurement to a point near the claim that from which you can see the survey peg and the nearest corner of the claims. Then take the second bearing and measurement from that point to the corner peg of the claim. This will decrease the accuracy of the survey , as more measurements generally means more errors . When done carefully, the additional error should be minimal.